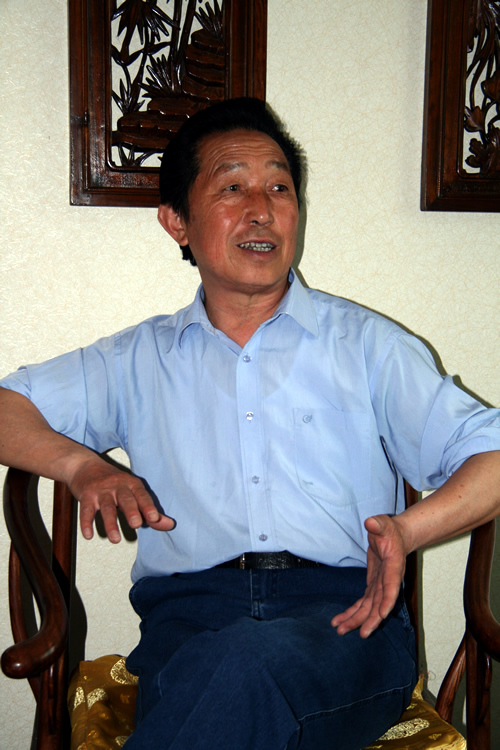 Ba Gua Zhang Master Gao Ji Wu was born into a famous martial arts family in Beijing, China in 1942. He began his study of traditional Chinese martial arts at age seven under the tutelage of his father and grandfather. Today, Gao Ji Wu carries on his family’s martial arts tradition. 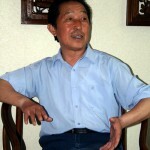 His expertise and understanding of Ba Gua Zhang and the Sixty-Four Hands is extensive and unique. A leading figure in the Beijing Ba Gua Association, Master Gao has trained many students for both self-defense and competition. 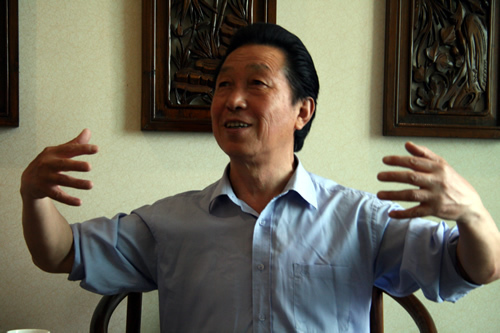 Tom Bisio, Valerie Ghent conducted the interview in Beijing, with Huang Guo Qi translating. Tom Bisio (TB): What is Ba Gua Zhang and what makes it unique compared to other martial arts? 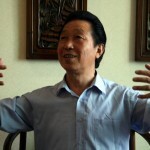 Gao Ji Wu (GJW): Ba Gua Zhang, Xing Yi Quan, Tai Ji Quan and Yi Quan are the three nei jia (internal arts). These arts train the body both internally and externally. In practicing, the most important thing is that we have our mind and intention in every movement. This is different than external styles which focus on external movement. In the internal arts there is self-cultivation, training and application. Mind concentration is very important, but we also have to understand the meaning of the movements – the attacking and defending techniques. Ba Gua, Xing Yi and Tai Ji are not practiced just for health or to make beautiful movements – one must understand the meaning of the movements. Practice must combine all these elements. In Chinese martial arts there are almost 200 distinct styles. In many martial arts, the movements are merely a copy of the animals – for example the monkey style. In the history of martial arts the martial techniques of the internal styles are outstanding. Why? In arts like Shaolin or Long Fist, performance is focused externally on what is powerful and beautiful. They are effective. However, in internal arts we stress guiding the strength with mind-intention. Head, hand and foot must move together to create simultaneous whole body movement. In Ba Gua Zhang every palm has a dual action, a stretching and contracting force that is a product of the mind-intention. For example in Ding Shi we have the Double Bumping Palm. My hands push outward but simultaneously also pull inward. This creates a dual action – stretching outward and resisting backward at the same time. Gao ji Wu stands up and assumes the double bumping palm Ding Shi posture. GJW: Yes. This is called double stretching power. We also emphasize having tranquility in movement and movement in tranquility. If we are moving, inside there is stillness, if we are still, inside their is motion. Each engenders and contains the other. When we train we also have to have an image in our mind of what we are doing. The movements in Ba Gua have names. These names reference historical events or images – for example “Zhang Fei Steals a Horse,” or Zhou Cang Shoulders the Knife. These names give you an internal image of the movement. Through these images, we cultivate our body internally and externally. In the novel Romance of the Three Kingdoms, Zhou Cang carried the dao, the knife, for General Guang. If we understand the story, the historical period and the character of Zhou Cang and General Guang, then we have an internal image of the movement. TB: What was your training like when you began to learn Chinese martial arts and Ba Gua Zhang. What other styles did you study? GJW: I started training with my father when I was seven. I began with the fundamentals – stretching, basic stances like ma bu (horse stance) and gong bu (bow and arrow stance). I learned the basics of Shaolin and practiced lines of Chang Chuan movements. At age 20 I started to train in Ba Gua, Xing Yi and Tai Ji. However I spent most of my time training in Ba Gua. All these styles were passed down through three generations, from my grandfather to my father and then to me. Extensive practice of basic skills, foundational skills – Ji Ben Gong – are very helpful when learning Ba Gua. I also studied the Zhan Zhuang of Yi Quan. It would have been better if I had studied other styles more. Studying other styles helps you to increase your understanding. My father always encouraged me to study other arts. He felt it could only add to one’s understanding. TB: Can you describe your process of learning Ba Gua. And can you describe the stages of training that students generally pass through in learning Ba Gua? GJW: No matter what style you study, the basic foundational skills (Ji Ben Gong) are important. They develop the correct intention. 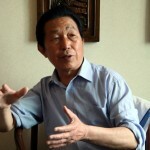 My father Gao Zi Ying stressed the importance of mind- concentration. He had many teachers from different styles. He studied Xing Yi with Li Cun Yi and Ba Gua Zhang with his own father and Guo Ge Min. He also studied Yang style Tai Ji with “Yang Chen Fu and Yi Quan with Wang Xiang Zhai. Students of my father and grandfather also trained in Yi Quan and Da Cheng Quan. Yang Dan Mao was a colleague of my father and introduced him to Wang Xang Zhai. They worked in the same factory. My father studied many different styles with different lineages, so he had a different approach ten others. My father’s nickname was Da Shi Luo (literally big basket that can contain many things) because he knew so many of martial arts styles. TB: Was he able to teach all these arts to his disciples? TB: Did your father teach different people differently and why? GJW: Whatever students wanted to learn, he would teach. If you wanted to learn Tai Ji then he would teach it. It was the same for other arts. Some people learned the other way. Whatever he happened to be teaching in the moment, they would try and learn it. If they mostly studied Tai Ji, and at that moment he was teaching Ba Gua, then they would practice Ba Gua, taking the opportunity to learn what was offered in the moment. Weapons, spear, saber and special Ba Gua weapons – he taught them all. When I teach, the method I use depends upon the age of the person and the personal interest of the person and like my father if I happen to be teaching something at a particular time, the students can join in and learn it. Sometimes I simply judge their ability and particular situation and decide what to teach that way. For example I might train young powerful people in attacking and defending techniques. To others it might be more appropriate teach them sequences or sets of movement and form. For children, I focus on basic training – stretching and stances and basic lines of single movements. TB: If your student is an adult who never practiced martial arts before and wanted to learn self-defense what would they start with? GJW: I would have that student train Zhan Zhuang, in order to to develop double stretching strength. Then they would learn to walk the circle using Tang Ni Bu (the mud walking step) and practice Ding Shi. Later, I would teach them how to use the attacking methods – the Sixty-Four Forms (Liu Shi Si Zhi Tang) and Seventy-Two techniques (Qi Shi Er Zhao). TB: Do you teach any other elements of Wang Xiang Zhai’s method besides Zhan Zhuang? Generally I don’t teach these other exercises. I use the training methods that are important to build up this kind of double stretching strength. Without the Zhan Zhuang, this kind of power will not develop. Other styles like Yi Quan have good points so we use them in our Ba gua. This makes our Ba Gua better and helps us to more fully develop ourselves. We take the best elements of other arts, other styles and employ them in Ba Gua. TB: Are there other specific Nei Gong methods that students practice as part of the training? GJW: Zhan Zhuang, Ding Shi and Tan Ni Bu (mud step) as well as He Xing Bu (crane step) are the key Nei Gong methods and exercises in Ba Gua. Crane stepping is a unique feature of Gao family Ba Gua as taught by Gao Zi Ying. The crane step is an important basic drill and nei gong practice. If you see someone training the crane step they probably learned Ba Ga from my father or myself. The crane step came from the Song style Ba Gua of Song Yang Xiang. My grandfather’s home was not far from where Song Yang Xiang lived, so was able to train with Song. TB: Is there a weapon that is characteristic of Ba Gua in the same way that the spear is considered to be the key Xing Yi weapon? GJW: The special weapons of Ba Gua are the various forms of the Ba Gua Rui, or more specifically the Chicken Claw Yin Yang Knife (Ji Zhao Yin Yang Rui). Other special weapons are the Hook-Sickle Swords (Gou Lian Jian) and the Mandarin Duck Knife (Yin Yang Yue) It is said the Dong Hai Chuan invented a kind of Rui with a chicken claw. However it is difficult to make this weapon, so many modern versions of these weapons do not have it. TB: You stress the importance of Tang Ni Bu (mud stepping). Why is it so important? GJW: Tang Ni Bu is very practical. The feet move close to the ground. The step is fast and helps the release of power, When you want to release whole body power you simply step and release it. Also the mud step acts as an internal exercise to build up the strength of the body. Similarly, the crane step also strengthens the body. In the crane you also focus on the breath, breathing in and out to the utmost. Both types of stepping aid balance and make your movements even, relaxed and stable. There are many schools of Ba Gua and none train in exactly the same way, but in all styles Tang Ni Bu is important. Li Zi Ming would talk about Guo Ge Min and how he stressed the importance of Tang Ni Bu, but in practice some students don’t follow this advice. TB: In the West many people now train for mixed-martial arts (MMA) – they train in Thai Boxing and Jiu-jitsu in order engage in free-style competitions. Does Ba Gua have effective answers for dealing with these kinds of fighters? 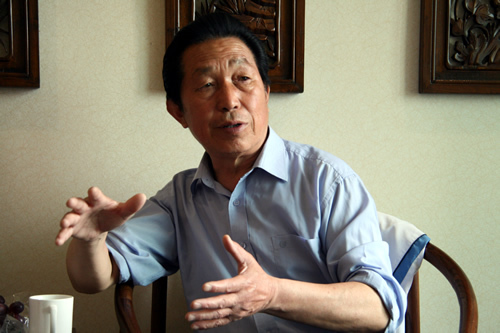 GJW: In Ba Gua Zhang every movement, every form can be employed in defense and attack. But the purpose of training in B agua Zhang and the other internal styles is not for this kind of free-style fighting. We call this kind of thing San Da in China. It is different. In this kind of San Da training there is no idea of health care and self-cultivation. The only purpose and goal is to fight and defeat opponents. In Ba Gua there are self-defense methods, but the main purpose of training is to preserve and prolong life, to maintain health and slow down the aging process. I am 70 but can still train and outmatch many 20 year olds. This is one of the benefits of Ba Gua. San Da and Ba Gua are different. San Da Training must be different, focusing on speed and physical strength and certain kinds of techniques. Ba Gua has killing techniques – for example in “Cloud Dragon Offers its Claws” – we are really plucking out the eyeballs, but we cannot actually do this in fighting – only in a real fight to the death, to protect your life, can it be used. We show the points to hit and the idea, but we cannot do it. We tell the students how to do it, but tell them not to do it. This is different from San Da. TB: Can you tell us a bit about the different styles of Ba Gua? GJW: There are many different styles from different masters. In the past they taught behind closed doors and there was little communication between styles and teachers. This still exists today – there are still conflicts between styles. When we teach we don’t say so much about this style or that style, but still the divisions exist. In modern times such conflicts have not disappeared. People would say, “teach your own students” – they are like your children. “Teach your own children; don’t try to teach other people’s children.” Some of this changed when Li Zi Ming organized the moving of Dong Hai Chan’s tomb to a cemetery. This event, and others like it, united the practitioners of the different styles. They came together and set up a Ba Gua association – established in 1982. Next year we will organize the 30th anniversary celebration of the Beijing Ba Gua Association. The association will organize teaching seminars, tournaments and other activities. Last year we had seminars about Ding Shi, attacking defending techniques and medical education on subjects like bone-setting, to exchange information. We all demonstrated Ding Shi and taught students how to teach. TB: There is a well known saying in Chinese martial artists that with each generation more of the art is lost. Do you think these kind of activities will prevent this from happening? GJW: One has to train and study continuously. Although I am almost 70 I still study new things and I review the things I studied with my father by communicating with my school brothers so that I will not forget anything. Teaching also refreshes me – keeps the material fresh. Not everyone could learn everything my father taught. Even I could not learn everything that my father knew. My father practiced martial arts all the time. I had to work and raise a family. In the past 10 years I have spent much energy and time teaching because I am retired and I now have more time to research, teach and practice. I retired a little early because I was invited to be vice director of the Beijing Wu Shu Assoc. I sacrificed a little of my pension to do that. TB: Today is there still a lot of interest in Ba Gua? Are students able and willing to learn the art? GJW: Most people are very busy these days. Many of my students are retired people who have time to learn. Younger people also learn Tai Ji or some Ba Gua. Some competition champions are very interested in learning Ba Gua with me. For example, I have students who are very good at Tai Ji, who want to learn Ba Gua because learning Ba Gua will help their Tai Ji. Some have studied Tai Ji for more than seven years but do not know how to use their Tai Ji, how to use the intention. They are just taught to do the form and look beautiful. Their training is to match the standard, to look good. They do not learn the purpose of the techniques. So they come to me to learn these things. TB: What were your father’s favorite techniques, forms and methods? GJW: He liked every style. But I personally observed that he trained in Ding Shi and Zhan Zhuang more than anything else. These seemingly simple things like Ding Shi and Zhan Zhuang are very difficult to understand. You have to practice them for your whole life in order to understand them. He also preferred the Sixty-Four forms and Seventy-Two Techniques because they contain many applications variations and changes. He loved to explain the meaning of these forms that we call attacking hands. For example, the criss-cross hands (applications stemming from the crossing movement of the hands as they turn into the millstone pushing posture) we talked about earlier today. Many changes can occur from the criss-cross hands – there are infinite changes and variations. In defending and attacking methods the important thing is speed and variation in the changes. Externally there is stretching and extending power while internally there are variations and changes. If I can reach you, that is the stretching and resisting force, but then the mind-intention guides the hands to change and counter. TB: Are there other things you would like to add or advice you would like to give students? GJW: It is important to understand that in learning these kinds of martial arts, it is necessary to develop your character – we do not just practice self-defense or just build up health. We also train to build character. If trained properly martial arts can build up one’s character. It is important to be a generous and gentle person. Be open and tolerant. After training for many years I have come to understand that although I can conquer others, and although I am not afraid if trouble comes, I do not look for trouble. If others make trouble, I can tolerate it. I just practice Zhan Zhuang and relax and stay calm. There is a saying: “don’t make trouble out of nothing.” You cannot always change the personalities of others, but you can change yourself. One must exhibit lofty morality and virtue in training the martial arts. The morality comes from one’s character, from one’s personal thoughts and behavior – one’s life attitude.